Body Language Sportswear is my latest workout attire obsession. A self-described gymrat, I arguably wear workout clothes more than street clothes – particularly in the summer; consequently, I’m constantly on the lookout for durable yet stylish sportswear. A couple of weeks ago, I paid a visit to the small but lively Body Language boutique on Cedros and Ventura Blvd. in Sherman Oaks, CA. With the help of the very cheerful co-owner, I spent over an hour trying on nearly half the store and had trouble eliminating. The cuts are feminine enough to wear outside of the gym (sorry guys, they don’t have a men’s line yet) and the patterns are vibrant and rival the usual blacks, blues, and whites usually spotted at the gym. Granted, their prices may be little higher than some lines (full price pants average $80, full price short tops $40) but it is true that one gets what one pays for. They have frequent sales too. More significantly, Body Language is made with the strong Supplex material that never fades or shrinks. My older pieces still look new a year later when I’ve since literally thrown away my cheaper versions. When all was said and done, I walked out of the boutique armed with eight pieces . . . and I never looked back. 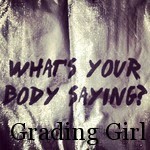 Grading Girl gives Body Language an A+ for unique style and durability! August 2012 Update: I am a fan of BL more than ever. It’s true the items I purchased three years ago are still like new (unlike many of my favorite cotton yoga pants), their pieces are more stand-out noticeable than ever, and the personal customer service is UNBELIEVABLE!! Stop in and say Hi. You just might leave with something fashionably fun in your hands.